For National Apprenticeship Week, the Apprenticeship Support and Knowledge for Schools (ASK) team partnered with AON to hold a CPD, which was open to teachers and career advisers from secondary schools and colleges across London. As a leading global professional services firm and a top 40 apprenticeship employer,* AON was a great company to partner with to hold an event on apprenticeships on Friday 8th March. They held the CPD event in their prestigious London offices, deep within the financial district, where the ten teachers were offered insight into the facilities open to apprentices who secure opportunities at larger companies. The session was designed to give teachers the opportunity to learn all the new developments around apprenticeships, especially at Higher and Degree level. AON representatives also gave the teachers information about what goes into delivering a quality apprenticeship programme and some useful ways to promote apprenticeships to their students. The talks got underway with ASK Project Co-ordinator Derrick Otchere, who spoke about apprenticeships in general. Detailing all the important points about apprenticeships, including what an apprenticeship is and how to find apprenticeship opportunities, he then gave the floor to AON representatives. AON’s Apprenticeship Manager Annabelle Senant delivered an interesting and detailed talk about the schemes available, life at the company and the requirements needed to become an apprentice within AON. She was followed by two former AON apprentices, now full-time employees, who discussed why they chose to become apprentices and their experiences while on the programme. 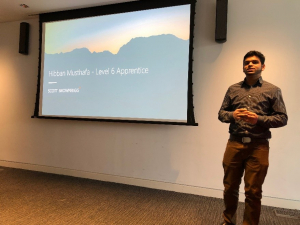 Individuals from three other companies also attended the event to give talks about the advantages of apprenticeships, including AON’s partner training provider FWD. As a leading training provider for the Financial Sector, their representative, Vikki Miles, provided the audience with lots of information on apprenticeships. There were further talks by architecture apprentice Hibban Musthafa and his mentor Albena Atanossova, from Scott Brownrigg. They discussed the architectural industry and the pioneering new architecture degree apprenticeship programme. 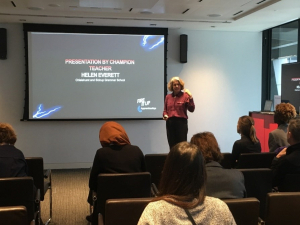 The final talk was from Helen Everett, an apprentice champion teacher who has supported many of her students in finding and then securing apprenticeship opportunities. If you are interested in finding out more about Inspiring the Future or ASK, please email apprenticeships@educationandemployers.org.